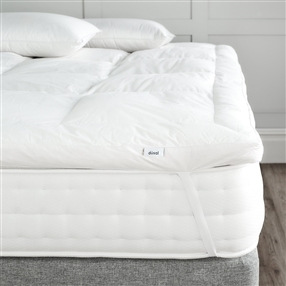 High quality duck feather and down mattress topper made in the UK from certified European duck feathers and down all encased in a 100% cotton Nomite® and Downafresh® certified case. We pride ourselves here at dùsal on our attention to detail on all our products. These mattress toppers are made with a 70/30 mix of European duck feather and down which fills a 7cm cotton case with cassette construction to ensure an even distribution of filling preventing any cold spots or uneven patches.